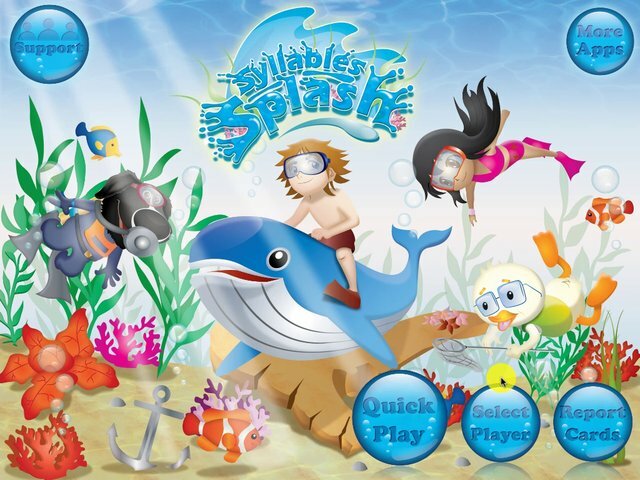 Make a splash this summer with your clients using Syllables Splash! This application is an under the sea motivational dream! 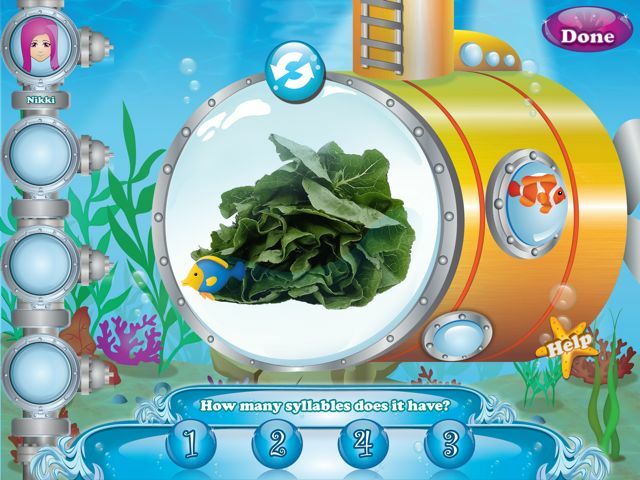 With an underwater diving theme and characters to assist in syllable awareness, this application is not only great for phonological awareness but fun! 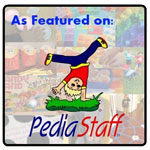 Continue reading for my review of this entertaining syllable awareness application! 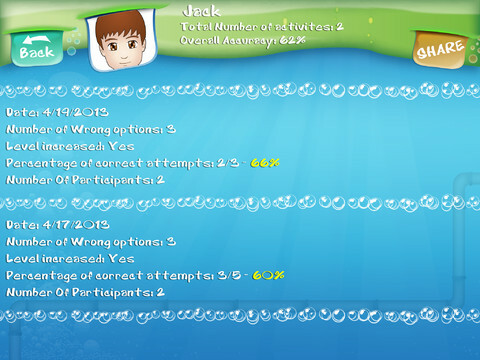 The Main Page of the application has five different buttons: Support, More Apps, Quick Play, Select Player, and Report Cards. About the App - Pressing this will give you information about the application and how it is to be used. Back-Up to iTunes - This will back up application data to iTunes for the ability to restore at any time. Restore From iTunes - This will offer the ability to restore previously backed up information from iTunes to the application. Pressing this will bring you to a list of Smarty Ears' iTunes applications to view which additional apps they have for sale and more information about them. Pressing on an application you are interested in will bring you to that app in the iTunes store. Once you press the "Select Player" button, make sure to add a student to the application prior to application play by pressing the "Add a Player" button. Pressing on the blank circular window will allow the user to choose an avatar, take a photo, or choose a photo from the camera roll to associate with their profile. Then, press below the "Name" text on the line to type the user's name via the keyboard. Press "Done" to add the user to the list of user profiles. You can edit profiles later by double tapping on the user's photo. Another way to add user profiles is through importing them via the free Therapy Report Center (TRC) application by Smarty Ears. By pressing this button in the lower left hand corner, you must have the Therapy Report Center application installed already on your iPad. You will be brought to the TRC app to choose a student profile to export into Syllables Splash. After it has begun importing, return to the Syllables Splash application. To learn more about Therapy Report Center, visit smartyearsapps.com. When Wrong: Press on a shell to choose whether to eliminate the incorrect answer or buzz when the incorrect answer is chosen. Number of Wrong Options: Press on a shell to choose between 1, 2, or 3 wrong options to be presented with each correct answer. Increase Level if Successful? : Move the sheel on the switch to choose whether or not to increase the level of difficulty when the user chooses the correct number of syllables. Include Words With: Choose between one or more of the following word types - 1 syllable, 2 syllables, 3 syllables, and 4 syllables - by pressing on the shell(s) next to them. Fish & Shark Animations: Determine whether or not to have the fish and shark animations used via a yes/no switch. Once these settings have been determined, choose up to four players to use the application at a time. Tap on the profile image(s) in the clam shells of the student(s) you wish to play. A green check mark will appear in the right hand corner of those you choose. Once you have chosen the users to play the application, press "Play". In the middle of an ocean scene, an image will appear in the center of a window on a submarine. There is also a button with two arrows forming a circle above the image which will cause the image to change to show the text of the word. Press in the middle of the image/text to hear the narrator read/state the word aloud. 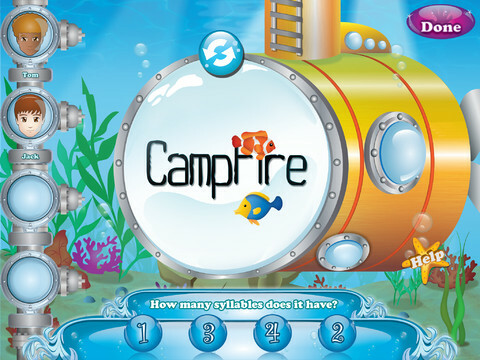 Then, the child must determine how many syllables the word has by pressing on one of the options at the bottom of the screen. Numbers of syllables are presented out of order. 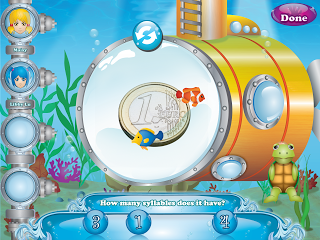 If the user needs help, he or she can press the "Help" starfish and an animated turtle will clap the syllables in the word for the user to count. If the client answers correctly, colored circles will move around the number and a sound will play. If the client chooses the incorrect number of syllables, the answer will either be eliminated, eaten/eliminated by a shark, or a buzz sound will play depending on the settings you have chosen. The client will have as many trials as there are numbers of syllables shown. If you are playing the application with a group of students, once the user chooses the correct number of syllables for his or her word, the application will move on to the next user. The order of play is shown on the pipe on the left hand side of the screen. Press the "Done" button once application play is finished and the application will head to the "Report Cards" page. Pressing the "Quick Play" button on the Main Page of the application will allow for single-user play without the ability to save the data at the end. 1-4 syllable words will be used with the "Help" and animations set to be on. Words are shown in the center of the application on the submarine window with the ability to flip between images and text and to play the audio by pressing on the window. Pressing the "Done" button will show the results of the individual session and the user will have the ability to "Share" the data via the Therapy Report Center from Smarty Ears or Skitch, Mail, Print, Copy, iBooks, or Google Drive apps. This menu can be accessed following application play or from the Main Page. Choose the student whose data you wish to view. Each session's data is separated by a line of bubbles. The user's name, total number of activities, and overall accuracy on the application will show at the top of the screen. Each individual session shows the date, number of wrong options, if the level was increased or not, percentage of correct attempts as a fraction and percentage, and the number of participants included in the session. 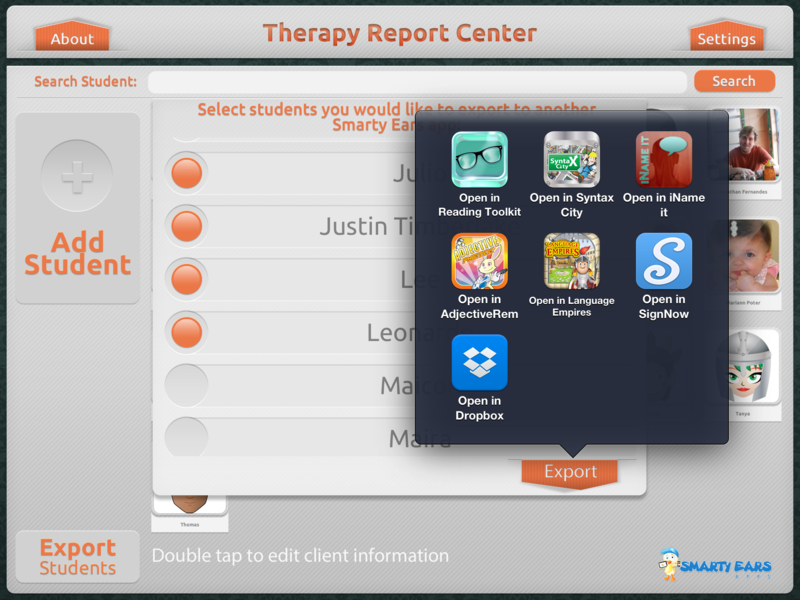 If you would like to share the data for your reports, you can open it in the Therapy Report Center from Smarty Ears or Skitch, Mail, Print, Copy, iBooks, or Google Drive. Just make sure you have the application you choose to open it in installed with the appropriate permissions and WiFi/3G/4G enabled if needed. Follow the directions of the other application to share the data. The application is simple to use and focuses only on one task - syllable awareness. 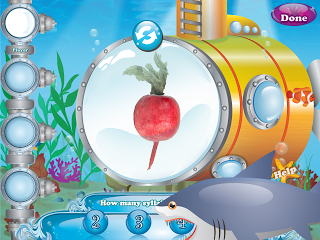 The entire application has an underwater theme where fish swim by, a shark eats incorrect answers, student profiles are shown in shells, and images are shown on the window of a submarine! 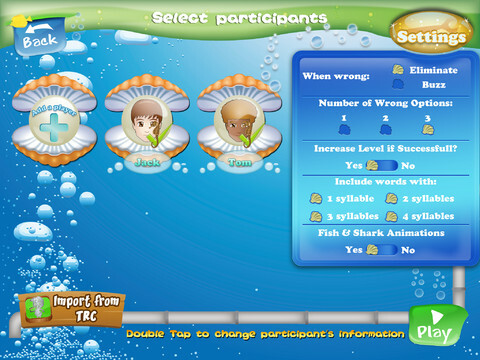 The shark, turtle, and fish animations make the application motivating to students! There are multiple settings to adjust based on the student(s) you are working with. Having the video tutorial within the application makes it so that the user can learn visually and auditorily how to use it, plus the user does not have to search for the video or tutorial online. The fact that you are able to share progress in ways other than through e-mail takes into account different therapists' ways of using the data given following use of the application. It's even better with multiple profiles being saved as well as the use of Therapy Report Center. I would love the ability to choose to have the number of syllables in order so that clients who need settings to remain the same each time. It would be great if the application also looked at production of mult-syllabic words with the ability to audio record and collect data on production. Phonological Awareness - Have students determine the number of syllables for each word by clapping, tapping, or counting them and pressing the correct number on the application. Apraxia of Speech - Choose the appropriate amount of syllables for the user to practice sounds in sequence within multi-syllabic words. Articulation - Children can practice their speech sounds in single and multi-syllabic words. Fluency - Practice fluent speech in multisyllabic words. Expressive Language - Students can create sentences using words from the application. 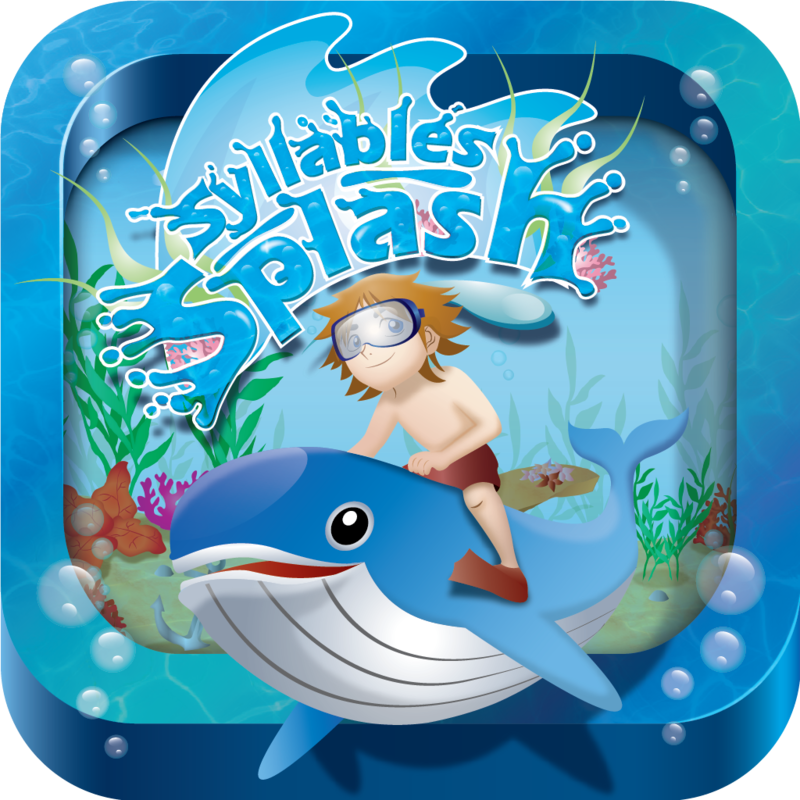 Syllables Splash is available for the iPad for $9.99. You can read more about this app from me at Yapp Guru. 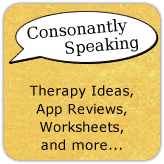 The author of Consonantly Speaking purchased a copy of the application herself but was asked by the developer to complete a review. No form of compensation was received.